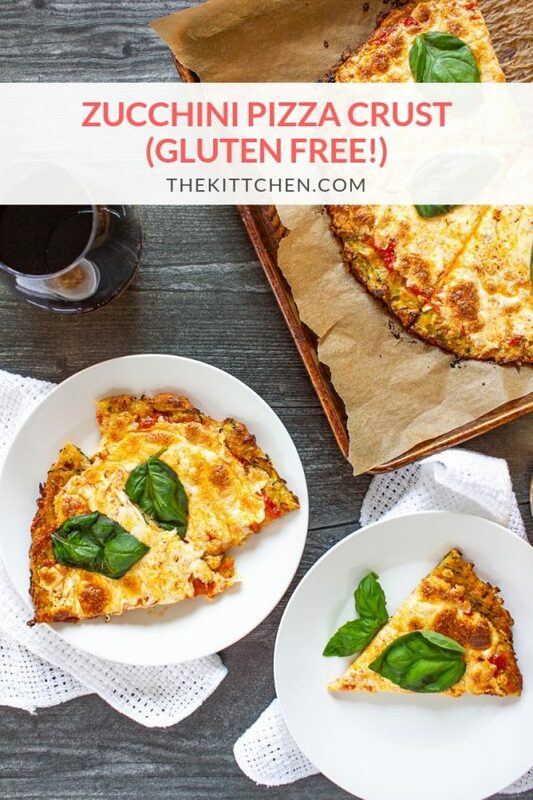 This gluten free Zucchini Pizza Crust is easy to make with just a handful of ingredients. Plus, it’s a delicious way to eat more vegetables! 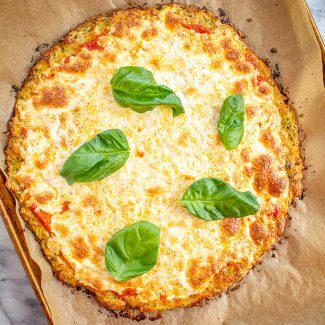 Zucchini Pizza Crust is a gluten free alternative to traditional pizza dough, and it tastes better than cauliflower pizza crust. Zucchini lends itself well to pizza crust because it doesn’t have a strong taste. It lets your toppings be the star. 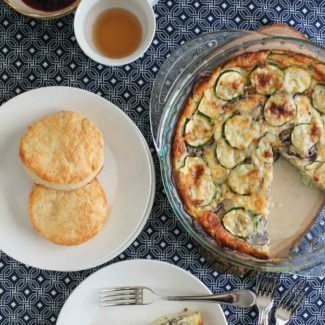 The zucchini pizza crust has a mild taste of zucchini and parmesan. It’s more appealing than cauliflower. 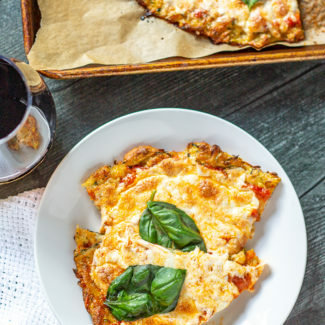 There are a couple reasons why you might want to make a zucchini pizza crust. The first is because it is gluten free. 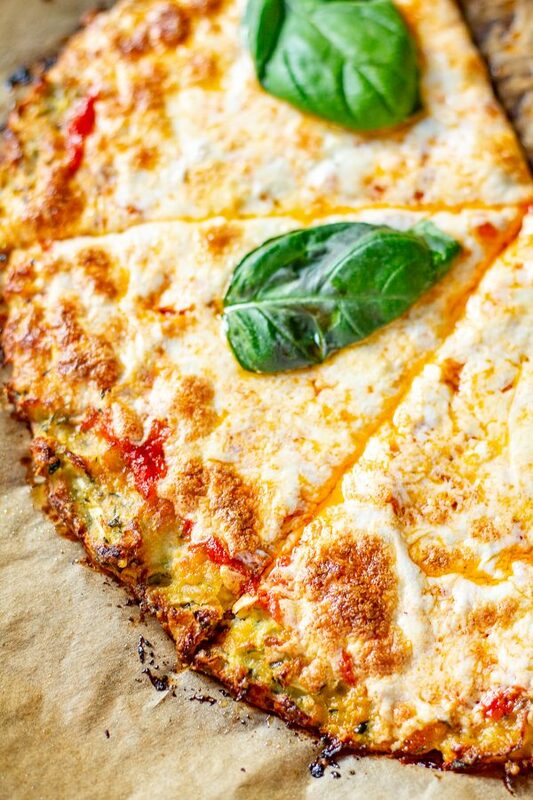 The second reason is that making pizza with a zucchini crust is an easy way to sneak more vegetables into your meal. Each crust is made with 2 large zucchinis. I wanted to make a gluten free crust, so I used gluten free flour. If you are just trying to add more veggies to your meal, you can use regular all purpose flour. You could also try using almond flour. Just make sure you use something that will help to soak up any excess moisture from the zucchini. 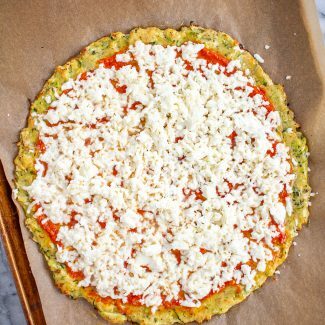 The process of making the gluten free zucchini pizza crust is simple. 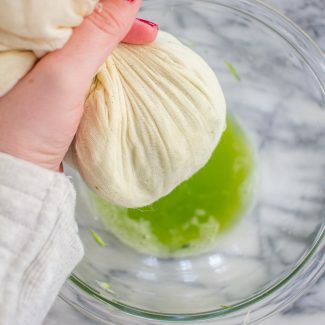 You grate the zucchini (you could also use a food processor), place it in cheesecloth or a clean kitchen towel, and then squeeze the moisture out of the zucchini. 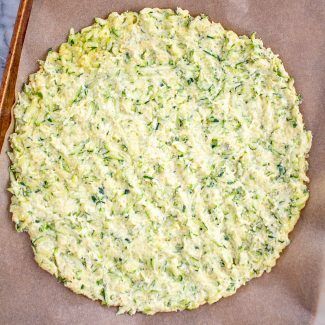 Stir in the other ingredients, and use the zucchini “dough” to form a 10-inch circle on a parchment-lined baking sheet. 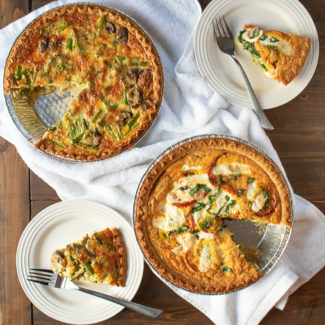 The zucchini pizza crust gets baked twice. First, it bakes for about 20 minutes, until it is very lightly browned. Then you add the toppings and bake it again for about 15 minutes. I used fresh mozzarella that I grated. 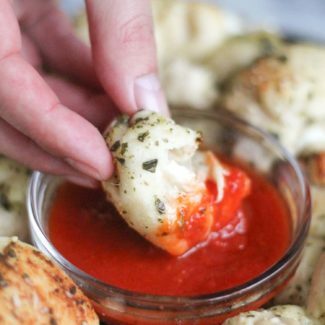 Fresh mozzarella has more moisture, and the crust would probably be crispier if you used pre-shredded mozzarella. The cheese is a matter of personal preference. Even with the fresh mozzarella, the crust wasn’t soggy and it could easily be picked up without being floppy. When I added the toppings to the pizza, I also brushed the naked edges of the crust with some melted garlic butter. This helps the edges of the dough to get crispy and golden brown while adding extra flavor. I used some Trader Joes garlic butter, but you could also add some finely chopped garlic to some melted butter. The pizza toppings are totally up to you. 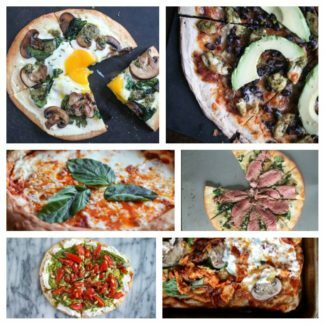 I made a classic margarita pizza, but you can add any toppings you like! 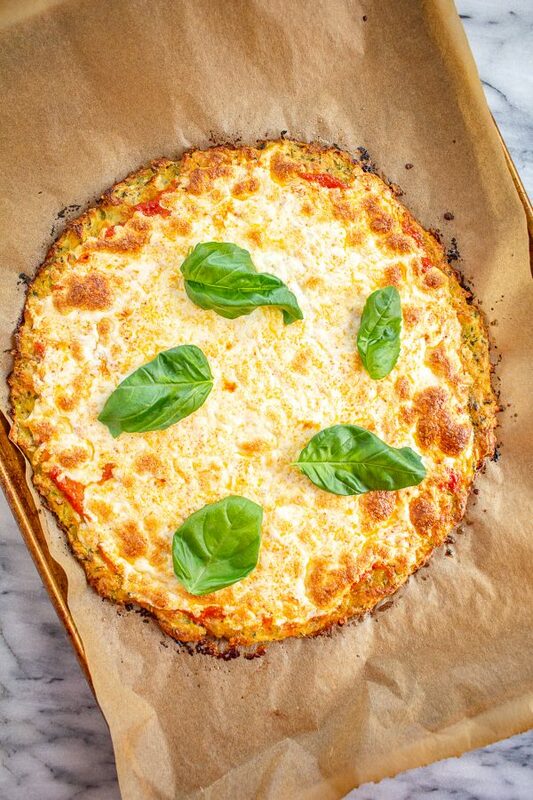 This gluten free Zucchini Pizza Crust is easy to make with just a handful of ingredients. Plus, it's a delicious way to eat more vegetables! 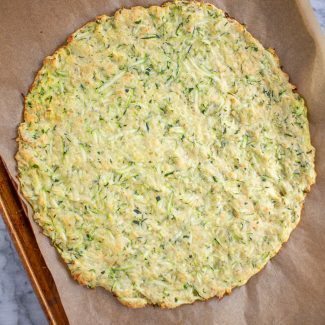 Zucchini Pizza Crust is a gluten free alternative to traditional pizza dough, and it tastes better than cauliflower pizza crust. 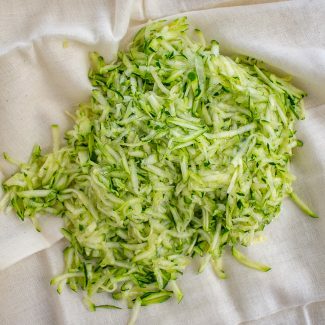 Zucchini lends itself well to pizza crust because it doesn't have a strong taste. It lets your toppings be the star. 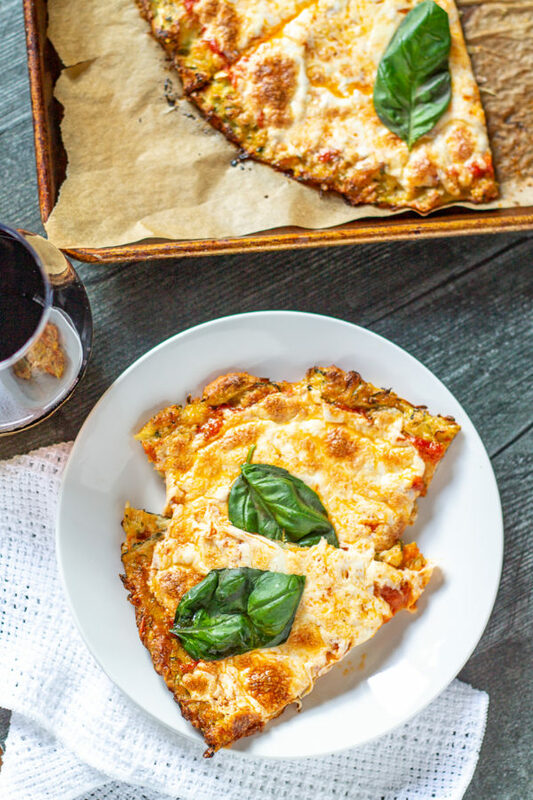 The zucchini pizza crust has a mild taste of zucchini and parmesan. It's more appealing than cauliflower. 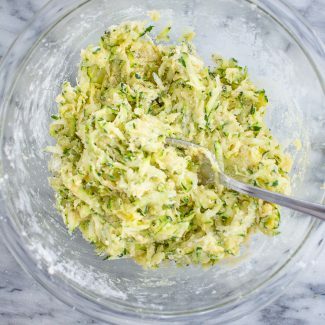 Use either a grater or a food processor to shred your zucchini. You want 2 1/2 cups of shredded zucchini. 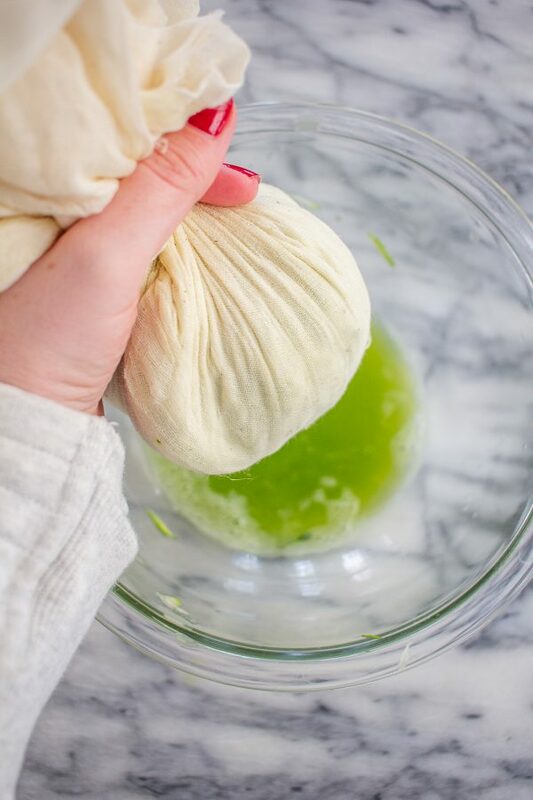 Place the shredded zucchini on cheesecloth or a clean kitchen towel. Gather the fabric around the zucchini, and twist the zucchini pushing the water out of the zucchini. You want to get about 1/2 cup of liquid out of the zucchini. Discard the excess liquid. 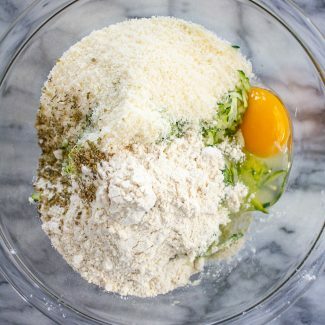 Pour the zucchini into a bowl and add the egg, gluten free flour, Parmesan, and oregano. Either finely chop the garlic or run it though a garlic press, and add it to the bowl. Stir everything together with a fork until everything is evenly mixed. The "dough" should be moist but not sticky. Add additional gluten free flour if necessary. Pour the "dough" out onto a parchment lined baking sheet and spread it out into a 10 inch circle with even thickness. 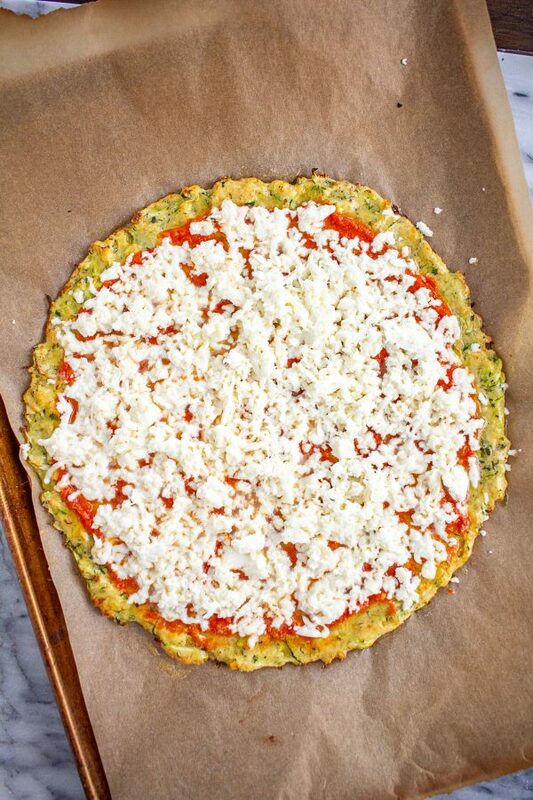 Bake the zucchini pizza crust at 425 degrees for 20 minutes, placing it on the lowest rack of your oven. You want the crust to be slightly browned. Add your pizza toppings. I added about 1/3 cup of tomato sauce and 1 cup of shredded fresh mozzarella. Melt the butter and then brush any exposed crust with the butter. This is optional. 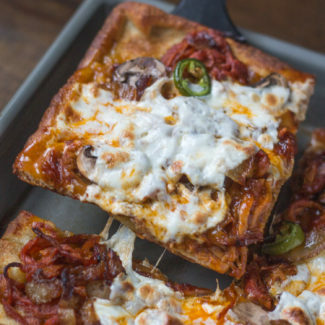 Bake the pizza for 12-15 minutes on an upper rack of the oven, until the cheese is lightly browned. 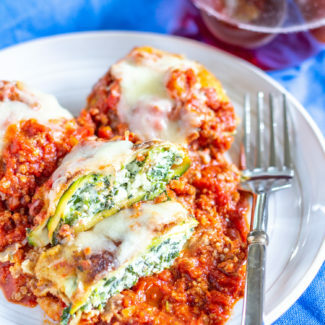 Top with the basil and serve right away. I used fresh mozzarella that I grated. 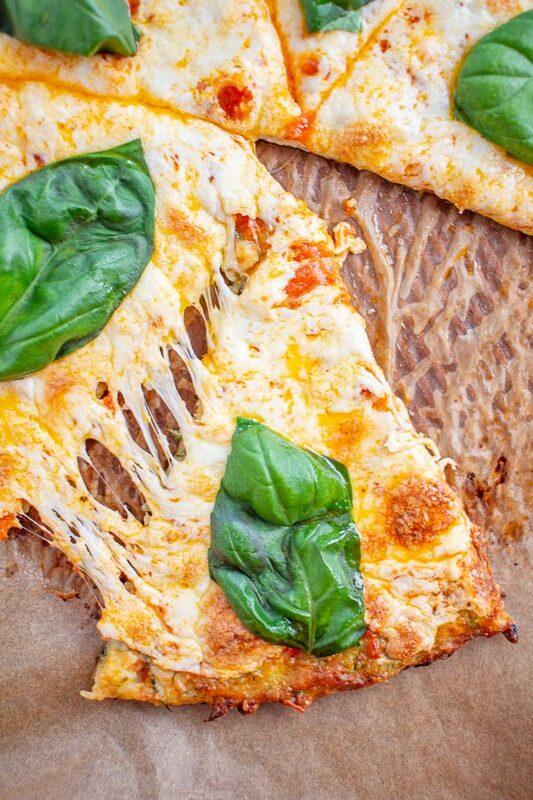 Fresh mozzarella has more moisture, and the crust would probably be crispier if you used pre-shredded mozzarella. The cheese is a matter of personal preference. Even with the fresh mozzarella, the crust wasn't soggy and it could easily be picked up without being floppy. When I added the toppings to the pizza, I also brushed the naked edges of the crust with some melted garlic butter. This helps the edges of the dough to get crispy and golden brown, while adding extra flavor. I used some Trader Joes garlic butter, but you could also add some finely chopped garlic to some melted butter.